As of 2017 – the most recent year for which data are available – 56 million Millennials (those ages 21 to 36 in 2017) were working or looking for work. That was more than the 53 million Generation Xers, who accounted for a third of the labor force. And it was well ahead of the 41 million Baby Boomers, who represented a quarter of the total. 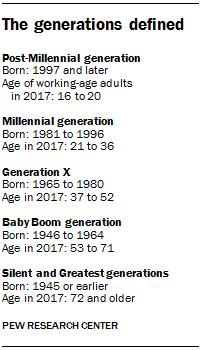 Millennials surpassed Gen Xers in 2016. Meanwhile, the oldest members of the post-Millennial generation (those born after 1996) are now of working age. Last year, 9 million post-Millennials (those who have reached working age, 16 to 20) were employed or looking for work, comprising 5% of the labor force. These labor force estimates are based on the Current Population Survey, which is designed by the U.S. Bureau of Labor Statistics and serves as the basis for its unemployment and labor force statistics. In 2017 the Generation X labor force was down from its peak of 54 million in 2008. The decline reflects a drop in the overall number of Gen X adults (Census Bureau population estimates indicate that their population peaked in 2015). In addition, last year only 82% of Gen Xers were working or looking for work, which is lower than their share in the labor force in 2008 (84%). Though still sizable, the Baby Boom generation’s sway in the workforce is waning. In the early and mid-1980s, Boomers made up a majority of the nation’s labor force. The youngest Boomer was 53 years old in 2017, while the oldest Boomers were older than 70. With more Boomers retiring every year and not much immigration to affect their numbers, the size of the Boomer workforce will continue to shrink. 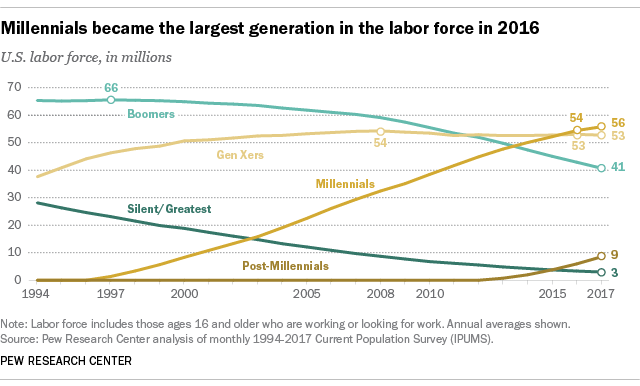 While the Millennial labor force is still growing, partly due to immigration, it is unlikely that the Millennial labor force will reach the peak size of the Boomer labor force (66 million in 1997). The Census Bureau projects that the Millennial population will peak at 75 million. At that number, a high rate of labor force participation would be needed to reach a labor force of 66 million. Note: This post was originally published on May 11, 2015, under the headline “Millennials surpass Gen Xers as the largest generation in U.S. labor force,” which reflected the Center’s definition of Millennials at the time (born between 1981 and 1997). This updated version reflects the Center’s newly revised definition, under which Millennial births end in 1996, and the incorporation of more recent information.